THE American Express Community Stadium is an excellent example of a new-style, modern venue – good sightlines, roomy, comfortable access points, welcoming atmosphere and on a sunny day, with seagulls flying overhead, there’s few more pleasant places to watch football. There is a drawback, though, and that’s the inadequate train service that serves the stadium. Brighton is not, by any means, alone in having poor public transport links, but 45 minutes after the game, I was still looking at the stadium architecture as I queued to get onto a train. That aside, the Brighton experience was a very good one. They do all the right things quite well, although the club is crying out for a safe standing area – apart from half-time, I did not enjoy the comfort of my padded seat for 90 minutes, which was fine if you haven’t paid £30 for a ticket. Clubs need to remove the blinkers from their eyes and start investing some of their TV money on new standing facilities, because actually, that’s what a lot of people want (I am not an advocate personally, but understand the dynamics of standing support). The entire away end stood for the whole game and not a single steward tried to get them to sit down – admittedly a difficult task. OK, next time I will get a ticket in the top tier of the stands along the touchline. Having seen Fulham beat Burnley 4-2 a week earlier, I was confident they could get a result of some sort at Brighton. The Seagulls had recently beaten Manchester United, which may have been more to do with United’s out-of-sorts mood than Brighton’s excellence, although 3-2 against one of the top six clubs is always an outstanding result. I’ve met Brighton manager Chris Hughton a couple of times over the years and I can vouch that he’s one of those “nice guys” you don’t often come across. He’s been written-off a few times in his managerial career, so it’s good to see that he’s getting the credit he deserves. Brighton and Fulham had mixed experiences in the Carabao Cup (Football League Cup to the purists). Fulham edged past Exeter City, while Brighton were beaten at home by Southampton. Although between them, the two teams had won only two league games in six, both sets of fans seemed quite optimistic – Fulham’s fans believing the best is yet to come and Brighton referring back to that afternoon against Mourinho’s United as an indication of what they can achieve when they’re on song. Certainly, from Fulham’s perspective, that 4-2 win against Burnley seemed to suggest the team of new hirings was starting to gel. The media, quite rightly, was full of praise for Aleksander Mitrovíc after his two goals against Sean Dyche’s team. Fulham fielded Alfie Mawson for the first time in the Premier since he joined the club, but the highly influential Tom Cairney was injured. 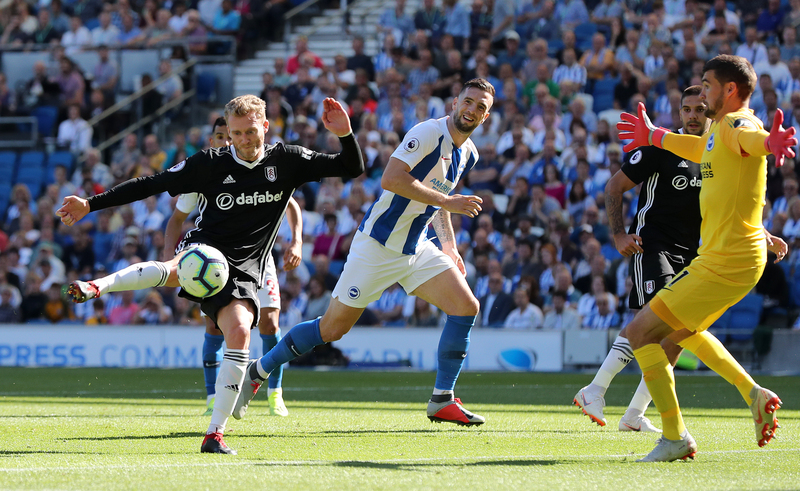 Fulham survived the early Brighton pressure but in the 24thminute, the home side were awarded a penalty. Here was a case of a savvy forward knowing how to draw a foul, Luciano Vietto applying the slightest accidental touch to send Glenn Murray to the lush turf. Pascal Gross took the penalty, but Marcus Bettinelli pulled off a fine save. Fulham went ahead on 43 minutes, Jean Michaël Sericleverly scooping the ball into the heart of the Brighton area, creating a chance for André Schürrle who finished crisply. That lead became 2-0 on 62 minutes when “Mitro” pressured Lewis Dunk into a mistake and his first effort, with his left foot was blocked by Mark Ryan but his second attempt, with his right, found the net. Two goals ahead, the points looked to be heading to London, until veteran gunslinger Glenn Murray stepped up. At almost 35 years of age, Murray is still “doing a job” for Brighton. In the 67thminute, he swept the ball home after the Fulham defence had been stretched and then six minutes from the end, he scored with a penalty after Mitrovíc had apparently handled the ball in the area. One final thought on the game – four very young lads (age 7-8) sat behind me, leaning on the concrete wall, all dressed-up in Fulham attire. For 90 minutes, I enjoyed their commentary on the game, ranging from, “How big is the crowd…I think about 25,500…Fulham need to attack more, then Brighton won’t be able to attack….I think Mitrovíc needs a partner in attack…Why does the Fulham manager always wear a suit? He must be very hot.”. They were delightful to listen to, if only to remind yourself that once upon a time, cynicism and world-weariness was for others. Fantastic! Brighton: Ryan, Montoya, Duffy, Dunk, Bong, Knockhaert (Jahanbakhsh 73), Pröpper (Locadia 73), Stephens, March, Gross (Bissouma 59), Murray.